Headlines: The fishing over the past week was again very good. 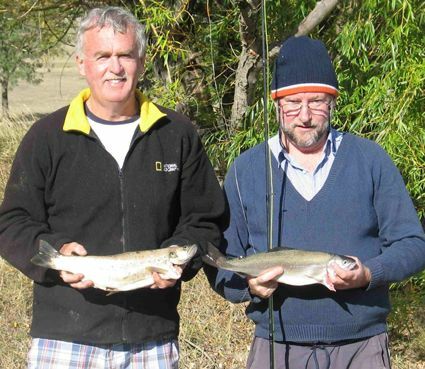 Lake Eucumbene has once again produced some great quality rainbows and browns. All methods have produced and the quality of fish coming in continues to be excellent. *We here a great many stories of both hard luck and good fortune in the shop. This week Pat Cohen from Sydney had a pearler and put together a few words to describe his last fishing session. I got down to Buckenderra at Lake Eucumbene around 3pm after picking up bait and tackle from the boys at the Alpine Angler. I baited up the rods with fresh spider mudeyes, put them in the bank and sat down for a beer and a sandwich. Within minutes one of the rods fell over. I thought it was the wind, but then as I went to pick it up it took off like a train into the water and out into the murk. I ran after it but it was of no use. It was gone. I was really annoyed as I had lost not only the fish but also my rod and reel. I settled back down to a consoling beer. Half an hour later a big fish rose and splashed about ten metres out. I thought that was strange. I looked around to see if the float from the missing rod was anywhere in sight, but no such luck. I settled down to anther beer. Half an hour later I noticed my other rod starting to tweak with a bite. I got up and strolled over to pick it up. To my surprise I had another bite as I picked it up and as I struck came up tight on a very heavy weight. I have got a big one on here, I thought. As I was reeling in I saw the fish take off and dive to the right but the fish didn't peel line off against the drag of the reel. I kept winding and it got heavier and heavier, suddenly the missing rod appeared out of the murky depths. I now realised that I was not only going to retrieve the rod but also had a good chance of landing the fish that took it. I picked up the soaked rod and landed a 1.2kg rainbow trout. What luck! The next beer tasted even better! 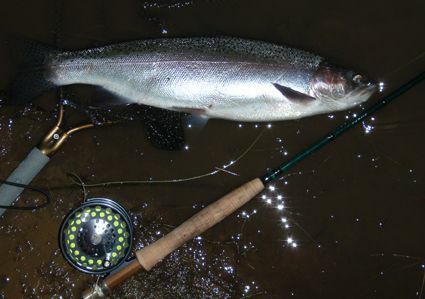 The last two weeks we have had numerous reports of anglers getting broken off on the strike or very soon after. Eight to ten pound tippet has been a far better option than fishing lighter at the present time. *Dave 'cloak and dagger' Longin and Phil 'tommy's got more hair than me' Petridis had a good session on the lake recently with both catching some quality fish. Locations, fly patterns and actual numbers caught were not offered for discussion, but needless to say they were both happy with the fishing quality. *The Felmingham crew Hayden, Glen, Craig, Lindsay along with Mick Burnham fished out of Crowes on the weekend and had some great fly fishing. They caught fifty odd fish between them with the biggest a 2.5kg brown. Mrs Simpsons were very good fish takers. *Kieran O'Shannassy had a good time on the lake again on the weekend with some very nice fish. Not as many as the previous weeks but the fish were of excellent quality. You have probably heard from others that the fishing at Buckanderra on Saturday night was excellent. The easterly wind dropped about 7.45pm, leading to one of the best mudeye hatches I have seen for years in the 4 hour dark before moonrise. The fishing was good with fish to the bank tending to be in the 1  1.2 Kilo class unlike earlier weeks where the size has been averaging around the 600-700 g range. I was accompanied by Mike Avent and Mike Roughton from Canberra. Both have been trying their hand at fly-fishing for the past 6 months or so, and both managed to break their drought with a nice brown and a nice rainbow respectively to the bank; a very nice introduction to the Gentle Art  as you can imagine, both were pretty chuffed at their first on the fly. They interspersed their fly casting with some bait fishing, and both finished with nice bags for the evening. *Alan Hocking fished with Les Marshall for five days and they landed thirty fish on the troll. Tassies # 67 and #Y82 were the best. All fish were 40cm plus in length. Between 7-10am were the most productive times with early and later a little slow. The early morning phone calls to the store, by Alan on his mobile, were always good. Even if we are at work and can't get out to help you bag out before 9.30 Alan! "It is a beautiful day on the water Tom, and I have already bagged out"
*Brett Galvin reports fishing the Eucumbene river with fly for only small fish but then left the river and decided to have a look at the lake (Seven Gates). "On my way back to Canberra. Put out a rod with powerbait in the orange/pink sherbet colour as well as casting a non weighted black woolly bugger around. Got three fish on the powerbait - two of which were just under 50cms and very healthy - the other 34cms and also very fat, and only one hit with no hookup on the fly. Got the good oil from your guy at the shop on Saturday on the powerbait and my family and inlaws (as well as myself) are most grateful. I should also mention I have never caught a fish on powerbait before, not that I've tried too hard, but got these three fish all in half an hour of each other around sundown." *Johnny Scrubworm reports some good sessions on the Mudeyes at Collingwood bay over the weekend. Some excellent browns and rainbows were landed by both Johnny and the Xuereb boys. Gary, John, Dave and Glen Xuereb all caught some great fish along with John Palmano. Only drama was when a few of the local foxes took to pinching some of their fish from the shallows, including a 2kg plus brown. The foxes even tried to get fish tethered to the angler and entered the water to do so. Needless to say a few of these introduced fish stealers were rounded up by shotgun on the following day. Water temps were around the 20 degree mark and the fishing was very, very good.